Have you ever seen giant chess? or played these type of board games before? And, do you know there's a giant chess board with pieces the size of barstools in The Curve? Okay, I didn't know that. 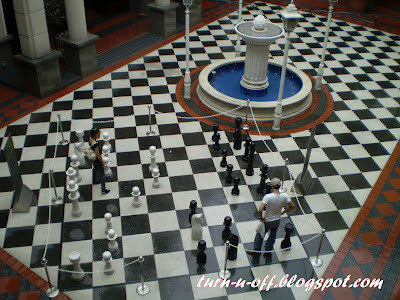 When I saw this giant chess set, I forgot about MNG. I forgot about NAF NAF. LOL. One of the greatest players ever, Capablanca said, "Women always want bigger and better." "You may learn much more from a game you lose than from a game you win. You will have to lose hundreds of games before becoming a good player." I, the horrible chess player wanted to enjoy a leisurely game of chess where I can actually play and get my brain stretch walk on the board, pick up the pieces and hop along as the "horse" took its correct position. So I stood there and watched them play. By the time the couple finished playing, it started raining!!?! So I went to MNG. By the time I reached there, it had closed for the day!!! DUH! I used to enjoy playing chess and bullying my cousins when we were kids. They weren't quite sure of the rules so I bluffed my way victory always ... LOL! Hi Monica, a friend presented me for my birthday a beautiful Italian marble chess set that now sits in my living room...I am very slowly learning how to play...by reading the game on the Net, 'how to play chess', ha ha. If you see that CD, "Fisherking', rent it...about a young boy and his love of chess. Lee.